It’s hard to believe, but I’ve been making these log entries for three years already. The events of the first two years are well chronicled. More sweeping changes came to the landscape in 2017, so let’s review! Our first trip of the year introduced a new member of the family, our dog Hannah. She bears a striking resemblance to, and shares a name with, a wonderful pooch I had growing up. And she shares her namesake’s love for Puckaway. It was a blast to watch our shelter rescue learn how to be a dog and have fun by tearing around the grounds. Outside of that, similar to years prior, there wasn’t much more winter activity save for a quick supply run. Just like last year, mid-April marked the first family day trip where we opened up the keep. Peter, in a bid for Neighbor of the Year, came through and ground 14 stumps in the yard just because he had a grinder for a day and is a great guy. 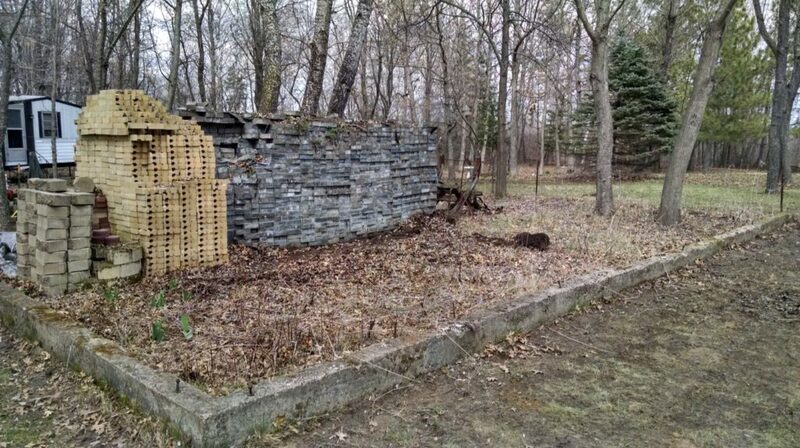 We also saw our first unpaid brick-removal team as my “free bricks” craigslist post paid its first dividends. A later April trip came with a major HD upgrade to the bird feeder camera, more brick laborers, the first bonfire of the year, and a trailer load of scrap tires getting hauled off the property. The groundskeeping projects got off to a great start this year. Jake and I kicked off May with a fun father-son weekend where we reclaimed the wildflower garden by the bird feeders and set up a second HD camera to keep an eye on the pole barn and burnpit. A day trip later in the month brought some keep upgrades in the form of new 275-gallon water tanks, a bigger yet more efficient AC unit, and indoor and outdoor temperature and humidity sensors. I took an afternoon in early June to mow, mulch, and prep the place for our new summer tradition, the June Dairy Days parade in Markesan. Red, Emmett, and Gunner came up for the weekend, we got a new TV stand for the keep, and a pair of rocking chairs for firewatching. 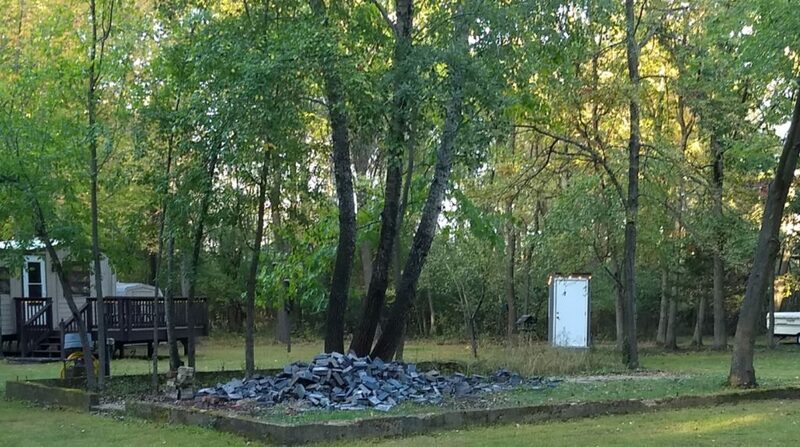 Red and I further depleted the brickpile by building a stand for the new keep water tank. At five times the size of our previous tank, we shouldn’t have to worry about running out of shower water any time soon. In fact, we might have too much water; a summer storm took out power for almost an entire day and halved one of the large maples in the brick garden. July was once again a lean month for visits, but I managed to get quite a bit of lawn care and tree trimming done on a late-month overnight trip. And thanks to some new equipment on the Puckanet, we can now pre-cool the keep by remotely activating the AC. I also compensated for a lack of summer visits by posting a short story and list of the various birds of Puckaway. In August, we finally had a good-sized bonfire and Josh got to come up without his big brother for the first time. And Good Neighbor Peter struck again, pulling up the rootballs from some smaller dead trees I had trimmed earlier. I also took a day to haul up a nice craigslist find, a new set of chairs for the keep. On Labor Day weekend, our entry was barred by a big, dead birch, which I made short work of with the chainsaw. Lyssa’s folks stopped up for the first time in a few years and got a rundown of all the upgrades. The last of the woodshed foundation was fed to the pit, I hauled three scrap riding lawn mowers out of the yard, and Aunt Judy’s went from daily necessity to once-per-trip-visit once Lyssa got the new skillet fired up. A mid-month supply run meant another load of riding mowers would leave the grounds and some more keep upgrades were put in place. A new microwave, some bar stools, and some real utensils helped flesh out the newly-useful kitchen. A mid-September weekend brought more brickseekers and put a huge dent in the stack. Refinements were made to the keep’s water supply, and the fridge and freezer got preliminarily stocked for Puckaweekend. Another storm and subsequent power outage prompted me to come check on everything and caused Hannah to suffer some humiliation. Things always pick up steam around here in October. Red and I paved the way for Puckaweekend with groundskeeping, tree trimming, and the removal of unsightly obstacles like the burn barrel. We also welcomed a 20-yard dumpster that would see use throughout the month and, in doing so, said goodbye to a bathtub full of glass. 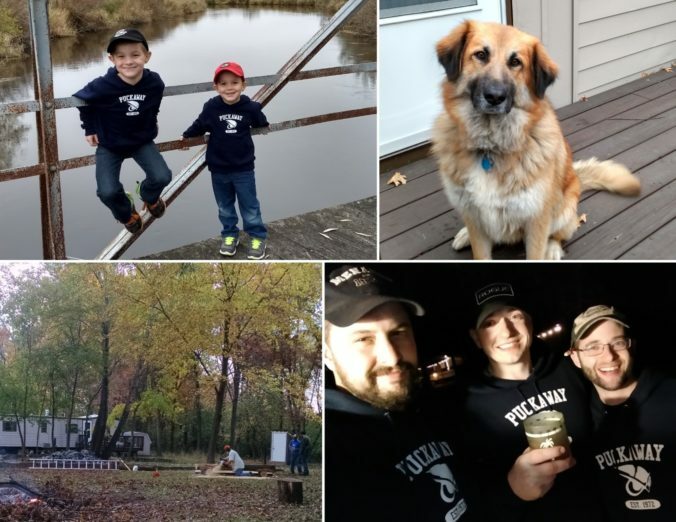 I had a fun weekend with my two boys where, outfitted with our new Puckaway hoodies, we explored the Germania Marsh Wildlife Area like my grandpa and I used to. It was a good month for the brand, as I also got to hang up the backlit Puckaway owl logo sign I got as an anniversary gift from my amazing wife. And then, once again, Puckaweekend was upon us. After tackling a few last-minute projects and restocking the fridge, freezer, and pantry, I picked up Sean at the Milwaukee airport and Puckaweekend began in earnest. We were able to make some Mayville stops on the way back as a bonus, and Red surprised everyone by making it up a day early. So began a four night, pit digging, tree felling, chili fueled, hard-drinking weekend of celebratory manliness. Notable new highlights include Red’s (welcome!) role as camp cook, Puckaweekend neophyte Jeremiah and all of his wonderful toys, the total emptying of the truck box in the driveway, and the filling to the top of that rented dumpster. The Puckaweekend hangover was cured by a major mid-November project: a new power pole! No more relying on an ancient, scary “pushmatic” 60-amp breaker to power the entire property. I can’t wait to build off of this by revisiting and amping up the runs to the pole barn and keep. I got a little discouraged afterwards, though, during a trip where everything seemed to break at once. That turned around quickly enough as I relaxed, gorged myself, and caught up with Farmer Joe during deer camp. A quick, early-December supply run closed out another year at Puckaway. It’s crazy how easy it is to acclimate to changes. I went into this post feeling like 2017 didn’t have much to show for itself in terms of Puckaway progress. Didn’t take long to prove myself wrong. We’ve redefined this place. We took it back from neglect and disrepair. That fight is over. Now we can shape and refine it as we get to enjoy the fruits of all the work it took to get to this point. It’s never been so fun to come up here. I love it.